This guide will include the trip through the castle meeting his henchmen, then the visit to Oryx himself in his chambers. I will also show the way in to meet Janus, Oryx's adviser and long time friend. Question - What kind of person/critter would have Oryx the Mad God as a friend? Finally closed the realm, Oryx shook our world and dragged us to his castle. There are 4 paths through the castle to his courtyard. Depending on the amount of people in the castle 1 to 4 of these paths will have people carving their way through. Break the first wall and move up though a bunch of critters and their boss the Brute of Oryx. The little guys cast slow and have a low damage attack which is not too bad and with max DEF or close to it is easily forgotten about. If the Brute orients on you his Armor Break which can be very deadly specially if you are already slowed and are being mobbed by his minions. It is best to avoid the Brute by either going wide around him or stand off and kill him at your extreme range. The Living Floor guarding the wall send out orbs that explode and cast quiet shrapnel which coupled with the Brute and his minions can just add to the carnage possibilities. Sometimes it is just best to know that you are going to be quieted and blast through the wall. Now that you are passed the Brute and his buddies break the wall, move through the next wall which is guarded only by a few critters. Break through that one and you will come the hallway being guarded by the Commander of Oryx and his insects along with a few other small annoying critters. These are pretty easy to go around or kill. Break through the next wall and you will meet another Brute of Oryx and his buddies along with another 2 Living Floor guarding the wall into the courtyard. Kill or pass these guys, break the wall to get into the courtyard. The courtyard will have 4 to 5 Brutes of Oryx and a pile of critters aiding and abetting. Your mission now is to plow by them and get to the bridge that goes to the Stone Guardians that protect the portal to Oryx's Chambers. This area offers a few temporary resting spots in the corners by the walls. You may have to clear out a few minions to have your rest though. There are two Living Floors by each breakable wall. You will be quieted, this is the time to use the offensive attacks don't worry about your mana, just pound the critters to get by the first wall on the bridge. This wall is very dangerous area, there can be more than one Brute here if it was dragged by the people rushing through the castle. This wall is almost always a source of one or more deaths because people were trying to rush to meet the Stone Guardians. My advice, slow down take out the Brute(s) and then go onto the bridge. The Bridge is guarded by another Commander of Oryx and his minions. Generally he hangs to one side or the other on the bridge, so most people just go around him to the last breakable wall. Once you get through that last wall you are now in the Stone Guardian's room. The fun starts here. I would recommend that you take 5 seconds and kill the Living Floors. You actually have the time to kill the Floors because the Stone Guardians have 2 - 5 second delay before they activate. As long as both Stone Guards are alive they won't go invulnerable. But, when one dies his attack pattern changes. He will throw his sword, generally to the center of the room where it sends out paralyzing shots (which hurt). Once you destroy his sword he will become vulnerable again and may move around before he throws his sword and restarts the cycle. When his sword is active you don't want to be next to it, the shots will kill you if you take too much damage. Take the last Stone Guard out and portal to Oryx's Chambers opens up. We are here, visiting the fiend called Oryx the Mad God. This guy can be a pushover with a large group. Everyone moves to be in one large group benefiting from Pally and Warrior buffs perhaps getting heals from Priests and Necromancers with Mystics casting the occasional curse. 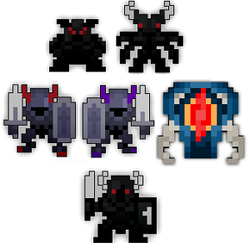 Have 20 or more people in this group with a good mix of classes will kill Oryx really fast. In smaller group you will have to work for your kill. He has a few different attack phases he goes through with periods of invulnerability. In many of his different phases you will have to dodge balls that can hurt lots, weakness shots, shots that quiet and a few others not to mention his shotgun blasts. Once you get to his last phase he doubles in size, chases people close to him, fires off large shotgun blasts and spawns minions that cast slow and have a good medium damage attack. The smaller the group the longer it will take to get him to his large chase phase. During this last phase, as he chases you around take care not to back into a wall or corner as his minions will slow you, mob you, basically preparing your hot body to become Oryx's cold corpse. Finish Oryx off, collect loot and admire his Wine Cellar portal, now where did I put that key? To go visit Janus the Doorwarden you have to kill all the Stone Statues that line the hallways in the 4 paths to the Courtyard. Once they are all cleared a hidden room behind the room that the Stone Guardians were in opens up. I should mention that there is almost no point in doing Janus unless you plan to go through to the Lair of Shaitans. If you plan to visit the Lair of Shaitans you will most likely need a decent sized group to do battle with him because it is very hard. When you get to Janus, stay out of the rooms corners, when the floors flash red you want to move to the area that is not red. Keep up the damage on Janus, kill the large White and Black balls and eventually he will die. He drops a chest and a portal. Crack the chest get the loot. Now you can go through the Portal and visit the Lair of the Shaitan. It is rumored that eventually there will be other special dungeons that could become available in this portal. Item and Pot Drops, Stone Guardians - DEF, Ancient Stone Sword, Wine Cellar Incantation. If you are in a small group, less than 20 people you need to hang back but not too far back if the group is moving fast because if you get left behind you may not make it to the Stone Guardians. If you get left behind it might be better to nexus. If your skill is not too great it would be best to stay in the middle of the group as you make your way through. Otherwise just rush through killing the critters if they get in your way. Watch for the Brutes and be prepared to be quieted. Rogues - good rushing class, but if you get quieted before you break through a wall, be prepared for the Brute to chase you down. Piercing classes - these types of weapons are a big help clearing out the minions and just general carnage. Knight - Stun your way through groups of monsters tanking all the way. Avoid the Brute if possible or if you have cleared enough of the Brutes minions then just go ahead and stun then kill the Brute for you and your buddies. Trickster - using their T0 prism they can teleport and run through hallways extremely fast. I tend to hang back from the breakable walls and as soon as someone breaks the wall I can see into the other room / hallway and teleport there safely away from the Living Floors. Mystic - Switch to your longest duration orb, stasis your way through. I don't think that the Living Floors can be stasised anymore. So basically just use curse and take them out or if you don't mind being quieted for a few seconds beat your way past. Assassin - Poison the heck out of Oryx, if your poison is still active when Oryx dies you typically get credit for the kill.